Fibonacci retracement, known also as Fibonacci Lines, is a technical analysis indicator. It’s a popular tool, based on a sequence of numbers identified by the mathematician Leonardo Fibonacci in the 13th century. Fibonacci developed the following sequence: 0, 1, 1, 2, 3, 5, 8, 13, 21, 34, 55, 89, 144 etc. As can be seen, each number is created by adding the two previous numbers together (0+0 = 0, 0+1 = 1, 1+1 = 2, 2+1 = 3 etc...). It is not this sequence in of itself that is so important, but rather the series of ratios it creates - 23.6%, 38.2%, 50%, 61.8% and 100%. The most important ratio is 61.8%, which is derived from the fact that each number in the sequence (except 0, 1, and 2) is always approximately 1.618 times greater than the previous. This 61.8% ratio is often referred to as the “golden ratio”, due to its importance and consideration as the most reliable ratio. The other ratios in the sequence are taken by dividing a number by other numbers further down the sequence. 38.2% is taken by dividing a number by the number that is located 2 places down the sequence. For example: 13/34. 23.6% is taken by dividing a number by the number that is located 3 places down the sequence. For example: 13/55. These ratios create a “predictive” indicator which provides important information on likely future price levels. No-one is entirely sure why these ratios play such a crucial role in forex trading, or trading with any other asset, for that matter, but thousands of test cases have proven how crucial they are in determining when a currency’s value will hit a critical point and begin to reverse or ‘retract’. A currency’s relative value against another tends to retract when it hits one of Fibonacci’s retracement ratios, allowing forex traders to use these points to determine the best currency price to buy or sell at. Although forex prices are heavily related to ‘trends’, prices do not tend to head up or down in a straight line, but rather meet various points of support and resistance along the way, Fibonacci retracement helps us to find these points. On most forex charts you should be able to click on a Fibonacci tool in the platform. Once you have selected this option, you must first establish whether the price is on an overall upwards or downwards trend (which should be fairly simple to work out). After this you choose a peak and trough from within a suitable time frame (say 24 hours) and you will be able to place the retracement lines over the forex chart. 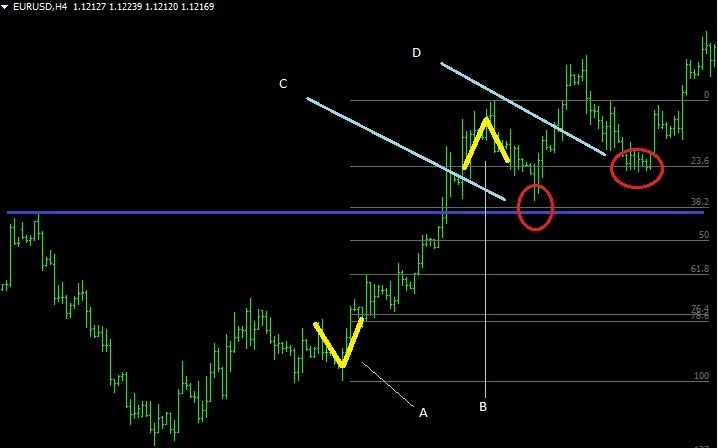 Below you can see an example of a Fibonacci tool being placed over an upward trending currency value, with A representing the trough and B representing the peak. Points C and D are the Fibonacci lines of 23.6%, 38.2% where the price hit points of resistance. Although you’re likely already using trends as a key part of your technical analysis, it’s recommended to pay attention to these Fibonacci retracements and to consider integrating them into your analysis. Many thousands of forex traders around the world use these patterns to help them get that crucial edge and buy and sell at the best possible price.